Recently I’ve been putting a lot of thought into what could be coming down the pipeline in Modern Masters 2017. A lot of players are drooling over the new Masterpieces in Aether Revolt—and I don’t blame them—but now is the time to think critically about the reprints we might see this spring. We’re still three months away from the release date, but the closer we get, the more people start thinking. In order to find the best plan, we need to be the first to make one—that way by the time other people catch up to the news and prices start to move, we’re already prepared. Today I’m going to discuss what I believe has a high chance of appearing in Modern Masters 2017 and why. In both psychology and finance, you’ll often hear that the best prediction of future behavior is past behavior. I don’t expect Wizards of the Coast to reinvent the wheel with this Modern Masters set, so there are some ground rules we can establish from older iterations. The first is that they always tell us in advance what time period the cards are drawn from. This Modern Masters set extends to the end of Dragon’s Maze. The most important thing to note is that this includes Innistrad and Return to Ravnica blocks, which were not part of Modern Masters 2015. The emphasis here will be trying to figure out which of the newer cards from these two blocks they have an interest in bringing back. While it’s not a hard and fast rule, both Modern Masters (MMA) and Modern Masters 2015 (MM2) had exactly 15 mythic rares. These sets differed in total size (229 cards and 249 cards respectively), but the mythic count remained constant. The one monkey wrench here are double-faced cards, which debuted in Innistrad and are thus eligible for reprint in Modern Masters 2017. A large number of double-faced cards would likely necessitate a different printing process and rarity breakdown (as it did in both Innistrad blocks). That said, with the double-faced planeswalker cycle in Magic Origins, Wizards showed its willingness to include this mechanic in small numbers and without messing with the rarity scheme. Barring a heavy double-faced component (and possibly even with one), there’s unlikely to be a change to the 15-mythic count. The last piece of criteria I will be using to make my predictions is how expensive a given card was by January 2016. There is a big lead time on set design at Wizards of the Coast, and if any financial considerations influenced their choice of reprints they were probably locked in by the beginning of the year. This means that cards that became expensive this year won’t be reprinted on that basis alone (although they might be for other reasons). We have two of each mono-color (10), two gold cards, and 3 artifacts. There are also only two planeswalkers, which I wouldn’t have considered a pattern until Modern Masters 2015 repeated it. Well, would you look at that. Two of each color, four colorless, and an artifact. Four of the major Modern staples from MMA (Vendilion Clique, Dark Confidant, Kiki-Jiki, Mirror Breaker, and Tarmogoyf) return for a second run as they obviously weren’t printed enough the first time around to satiate demand. They learned their lesson this time and included Elesh Norn without the rest of the Praetors to bog down the mythics. Generally, you were pretty happy if you opened a mythic that wasn’t Comet Storm (really guys? Comet Storm, of all things?). With all of this in mind, I’m going to go out on a limb and predict that we will see a distribution closer to MMA than to MM2. There aren’t a plethora of colorless cards that need to be reprinted, but there are plenty of gold cards to choose from. There aren’t a ton of white cards that would make for exciting mythic rares in a new Modern Masters set. Both of the white mythics from MMA got swapped out for MM2, and I’d almost expect the same to happen here. The one card that might have enough demand to return is Elesh Norn. This is my short list of “possible and probable” white mythics. There are not a lot of exciting or expensive mythics from the newest sets added to Modern Masters 2017 and the only existing miss from Modern Masters 2015 was really Linvala, Keeper of Silence. Elesh Norn is pretty reasonable for competitive and casual players and I would not be surprised if it was back again. Auriok Champion is a weird card that, while expensive, is technically a rare. It was only printed once in Fifth Dawn, which is a set that did not contain mythic rares. Wizards has shown a leniency to upgrading rares to mythic if they initially came from a set without mythics (Tarmogoyf, Dark Confidant, Kiki-Jiki, Clique, Bitterblossom, Vedalken Shackles, both Swords, and all of the Dragons were upgraded). Blue has a better selection of reasonable cards to print at mythic, and this time I think we’re going to see the retirement of Vendilion Clique. Alright, before you freak out at that Jace, the Mind Sculptor image, let me explain. These are cards I think could get printed at mythic. I’m not guaranteeing anything because, at best, these are just guesses. So before you run to the comments section to tell me that I’ve gone completely mad to put a banned card in this section, let me remind you that Bitterblossom used to be banned and Splinter Twin got banned after it was reprinted. And many Modern players and commentators have argued that Jace would be relatively safe to unban. There have been just enough Jace reprints that it could finally see the light of day in Modern without becoming $100 overnight. There is one B&R update before Modern Masters 2017 releases (the one for Aether Revolt), and I would be cautiously optimistic that a potential Jace unbanning will be accompanied by a reprint. Currently you can find Eternal Masters copies for about $45, and that’s probably still artificially high considering how many copies are played in most decks. Aside from that, I think Ancestral Vision is the most likely reprint here. It hasn’t been reprinted in a booster set since the original printing, so upgrading it to mythic is easy. 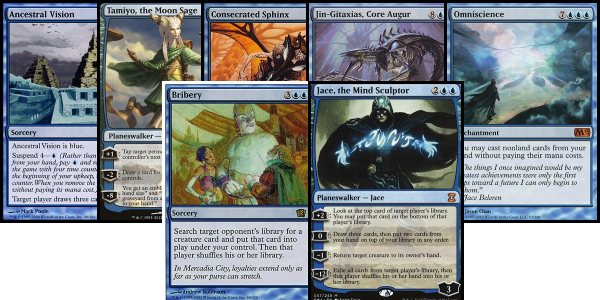 I think Tamiyo and Consecrated Sphinx are probably the next most likely to get reprinted. They are basically on par with Tezzeret the Seeker: popular casual mythics with price tags that don’t make you feel bad when you open them. Jin-Gitaxias, Omniscience, and Bribery also have outside chances of being chosen due to their price tag. You’ll notice that I’ve included all five Praetors in my list. They’ve gone long enough without a reprint that they’re all relatively expensive, and each one has significant casual appeal. On the subject of Snapcaster Mage, I think it would be a mistake to reprint it at mythic, and it will likely be a rare. It’s not out of the realm of possibility, however, that they deem the rest of these cards not good enough and that it ends up a mythic too. Clearly they’re just going to put Liliana of the Veil on the sheet twice. Nothing else. Okay, fine. They probably won’t do that. 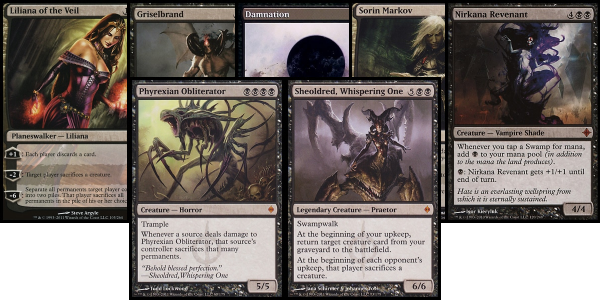 I think that Dark Confidant will also probably retire this year, replaced by Liliana as the best mythic in the set. Past that, there are a few competitive choices (Griselbrand and Damnation) or a few casual $18-plus mythics that are probably considerations. While nothing really lives up to the hype that Liliana will bring, it’s important to note that Wizards of the Coast continues not to reprint Damnation, so I wouldn’t get your hopes up. All of these cards will feel better to open than a Comet Storm and that’s mostly my goal. 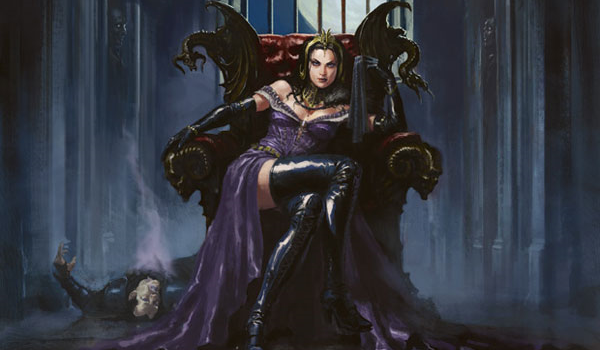 There is maybe a bizarro world where our mythics are Liliana and Dark Confidant, but at that point they might as well just call it the Jund Starter Kit. I hope Wizards of the Coast has as much trouble as me trying to figure out something exciting for this color. The mythics are not impressive. So I’m going to go out on a limb and say that Comet Storm and Kiki-jiki aren’t returning. The best card to put at mythic would be Through the Breach, but it has a pretty big problem. As of June 2015 it was $10. Now it’s $45 and still climbing. At the time they would have made the decision to reprint, January 2016, Titan Breach was a blip on the map and Breach was a reasonable-sounding $20. The price of Primeval Titan (the most likely card to sneak into play with Through the Breach) has mostly been kept in check by its very forward-thinking printing in Modern Masters 2015. So it’s possible that they similarly noted Through the Breach as a reprint target. Outside of that, I think Past in Flames would be a fine complement at mythic to a larger flashback theme. Thundermaw Hellkite is just a dude but he’s a few bucks. Urabrask, like the other Praetors, is expensive and old so it could be a consideration too. Koth, finally, is the least likely of these because he already had a Duel Deck printing. Overall the pool of red mythics just isn’t very deep. It’s even less impressive than the white offering. The one card on everyone’s radar, which is more expensive than most of the cards above, is Goblin Guide. I think it would look pretty bad at mythic though, and it’s probably better served as a rare to help with the supply problem. With Liliana all but guaranteed to soak up a ton of the value in this set, I can see a world where we don’t get Tarmogoyf again. Two $100 cards in the mythic slot would mean either terrible mythics in the other slots, or a set that’s immeasurably hard to find. Green is also not a particularly deep color for expensive competitive cards, outside of Tarmogoyf. Vorinclex, like the other four Praetors, is expensive and popular with casual crowds, which makes it reasonable to open. Craterhoof Behemoth is also fairly expensive, and sees play in both casual and competitive decks. Like Goblin Guide, Scapeshift would be better served as a rare but it’s from a set with no mythics so a rarity upgrade is possible. Azusa is kind of in the same boat. She’s not as popular or expensive as she used to be when the Amulet Bloom decks were running rampant—but she’s still popular in Commander and would fill the mythic slot better than another Comet Storm. This is the area where I think we could see a lot of repeats from past MMA sets. The most expensive colorless, artifact, and gold cards have already been reprinted once in a Modern Masters set. Emrakul, Kozilek, Ulamog, Karn, and Mox Opal are all pretty expensive again. The only new cards in this section that I could really see as a mythic reprint are Ensnaring Bridge, Blightsteel Colossus, and Voice of Resurgence. If they decide to print Liliana and Tarmogoyf, we might see less expensive mythics that still play a role, like Wurmcoil Engine. The real kicker here is that many of the most expensive artifacts were already reprinted in Modern Masters as rares. Aether Vial, Chalice of the Void, and Engineered Explosives are just a few of the original Modern Masters cards that really need another printing—just not at mythic. What do we do with all of this information? There isn’t a ton to glean, but my main takeaway is that a lot of the plausible mythics in this set just aren’t very good in Modern. Most of the cards people want reprinted are cards that should appear at rare. If we’re lucky, we’ll get a set more like MMA than MM2. Of course, Wizards knows a lot more about the upcoming sets than I do, so we might see some cards that weren’t on anyone’s radar. Like the reprints of Eye of Ugin and Eldrazi Temple right before we went back to Zendikar, we may see reprints that imply a coming need later in the year. For a set called “Modern Masters” there are a LOT of cards listed here that, while amazing, only really see play in Commander and other formats that are not Modern. If you look at the past Modern Masters sets (as Jim did) you’ll see a similar pattern. Same thing with Eternal Masters and Vintage Masters (a MTGO-only set)—tons of Commander fare. Wizards uses these sets to seed things for other players as well. We are almost certain to see some number of mythics and rares that are unplayable in Modern. Don’t get me wrong, I’d LOVE to see almost everything on this list. But knowing Wizards, they would likely put in unplayable jank that “helps the Limited environment” before giving us tooooo many good things in one set. Especially when many of those would be better suited for future Conspiracy/Eternal Masters releases (which seem to focus more heavily on Legacy/Commander). We’ll see how much they learned from EM and CN2, because MM15 was extremely polarizing to begin with and got even worse when they banned Twin after reprinting so many staples for the deck. “Confident” is not a word I use to describe their reprint management. There was really only 1 mythic in MM15 that was for the limited environment (comet storm) so its not totally out of the realm of possibility that they use this time to put some big cards at mythic that are also build around cards. For example, craterhoof behemoth at mythic and the set also has unburial rites. Very interesting article. Assuming they one day end up reprinting Damnation, are you confident it’ll get moved up to Mythic? It currently has the price tag to support it of course, but that’s basically ONLY because it’s an old rare from a set that wasn’t opened a ton. Wrath of God/Supreme Verdict are both less than 10$ for the same effect and are consistently printed at rare, is it too much to hope that they print Damnation at rare as well? Also, do you intend to do a similar article for rares? I know that’s a bit more of a crapshoot since there are way more possible choices and slots for them in the set, but an informed look at the likelihood of seeing staples that people want in the set would be interesting. Hopefully Snapcaster is a lock and doesn’t get rarity shifted (obviously we won’t know 100% until it’s spoiled), it and Lili of the Veil are the 2 cards I think everyone expects/wants out of this set, and not delivering on that expectation would be pretty disastrous in my opinion. Lastly, how much do you think having been printed in a previous MM sets affects the likelihood of being printed again? I don’t think it has a big impact on mythics, as history has shown, knocking their price down with consecutive printings is more important than mixing it up (plus the pool to choose from is a lot shallower) but what about rares and lower rarities? Cards like Chalice of the Void, Blood Moon, Arcbound Ravager, Aether Vial, Path to Exile, etc have been done in MM before, but they’re expensive again and due for a boost in circulation. I just wonder if WotC is likely to shy away from these cards to avoid making the sets too similar. Honestly, it’s too early to tell and too hard to guess what rares might be in the set. I will revisit this once we get closer to the set release and have a few spoilers. I just wanted to add a land which has a quite high value and that needs a reprint due to it. Nobody thinks that Cavern of Souls should be reprinted? Now we have quite a big amount of decks which could use it (Eldrazis, Spirits, Merfolks, Elves…), so I believe it’s a good time for it. I’m crossing my fingers! A lot of people are similarly hoping for Cavern, and I’m sure it’s on WoTC’s radar. That said, it was rare the first time around and probably would be this time too. I’m not sure Cavern of Souls was expensive enough to be on their radar when they were designing the set. It’s probable at rare if it is reprinted because its the type of card that would really not benefit a ton from a mythic reprint. It’s also from a time period that included mythics so my stance has been to assume those won’t be upgraded. We haven’t had a rare upgraded to mythic in this booster set unless it was only printed in sets that did not contain mythics to begin with. How many percentages do you think Snapcaster will drop if it is printed as (A) a rare, (B) as a mythic? Also, if, as has been speculated, preordain is unbanned how much would that affect the price of snappy? I’m not sure Snapcaster Mage’s price will drop at all if it’s reprinted as a rare. It’s already fallen a great deal due to people expecting it to get reprinted. I would expect it rebounds a bit faster if it’s a Mythic. I would not be surprised if it was still a $50 mythic. If Preordain is unbanned there is not enough information to tell us if that would affect the price of Snapcaster Mage. Surely they are good together but there is no data to suggest which deck would benefit the most. Traditionally the blue card selection is banned to stop combo decks and not control style decks that play Snapcaster Mage. As far as black cards go Lilly is going to get the #1 spot obviously and #2 should go to Damnation over Griselbrand or Obliterator etc. Griselbrand isn’t too expensive right now and it just had a GP printing recently. But Damnation is played in so many more decks in all the formats it just makes the most sense to me. Damnation has it’s own hashtag #freedamnation following to pete’s sakes! Agreed that Damnation needs the reprint most after Lili, but why should a color-shifted Wrath of God (5$ rare) be moved to Mythic? I asked Jim for his opinion on it above, but I still don’t think they should do it. They reprinted Cryptic Command at rare when it was pushing 55-60$, why wouldn’t they do it for Damnation? As far as I’m concerned, there is no justification for moving that effect to Mythic rare, and doing so would be a bit of a slap in the face, not to mention that it wouldn’t help bring down the price nearly as much. I’ve got my fingers crossed for Lili and Obliterator at Mythic and Damnation at Rare. I’m personally expecting Griselbrand at mythic because it’s a modern card with a modest price tag. It’s hard to include too many expensive cards because if the MSRP of a pack is lower than the EV of a pack then you get into situations where stores often charge more than MSRP. MM15 was a pretty good middle ground where the MSRP of a pack and the EV of a pack on release was close enough that it wasn’t impossible to find booster packs for $10. Hey Jim, outstanding article. I know you already pointed out there are too many rares that can be included, but aren’t there a group of them that are as likely as LotV to be in? Some mention Goblin Guide for example. Thanks for the all the work, it’s really helpful!